I mainly work in the formation of stars and young stellar clusters. 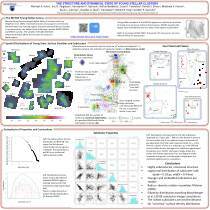 I study properties of hierarchical star-cluster formation, the dynamics of young stellar clusters, and the dispersal of stars from these clusters into the Milky Way. 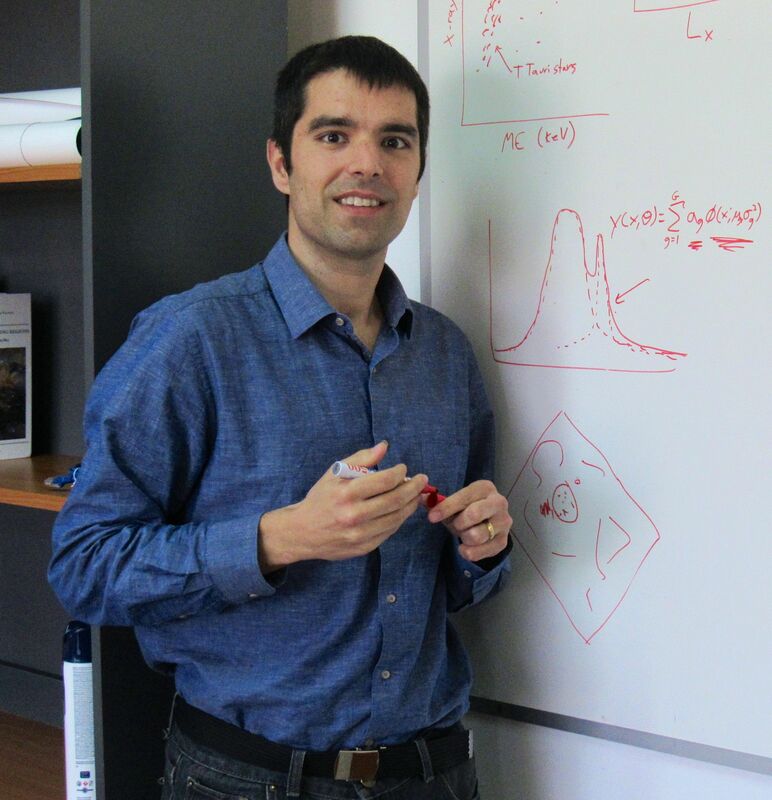 I am interested in astrostatistics, in particular, mixture models and spatial point processes. The formation of star clusters is fundamental to astronomy because most stars form in groups of hundreds to thousands of stars, which later disperse. We studied a young, nearby cluster, NGC 6231, to learn how clusters evolve once their stars have formed. Paper I - A deep new catalog is generated for the cluster based on X-ray observations (Figure 1) and VVV near-infrared photometry. We find evidence for a slight decrease in X-ray luminosity after several million years. We also find that a larger fraction of massive stars have pre-main-sequence binary companions. Paper II - The cluster is remarkably well fit by an "isothermal sphere" surface density profile (Figure 2), despite its young age. 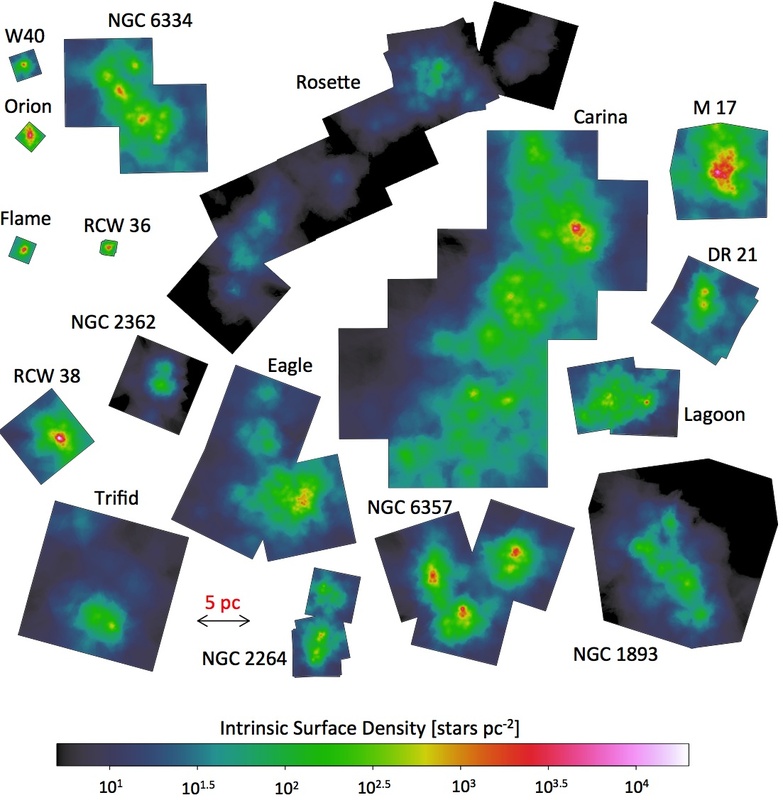 Figure 3 compares the mass and size of NGC 6231 to groups of stars in other star-forming regions, including "typical" star-forming regions like those studied in the MYStIX project, and extreme, star-burst regions. We argue that NGC 6231 represents the end state of cluster assembly for a "typical" star-forming region. Fig 1. 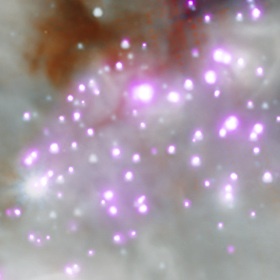 Chandra X-ray Image of NGC 6231. Fig 2. 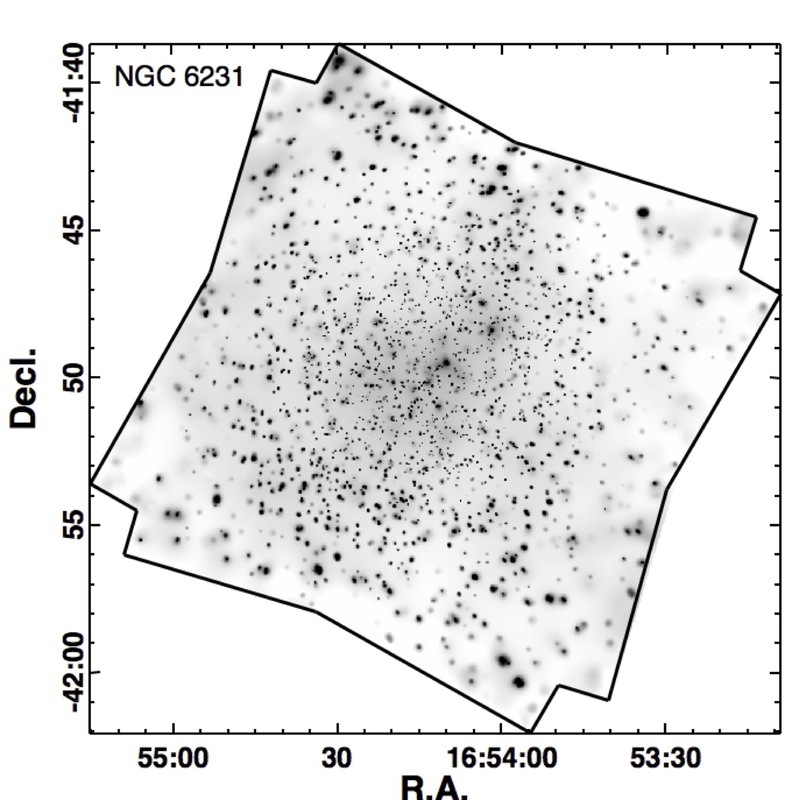 Comparison of surface density models (gray lines) to the observed distribution of stars in NGC 6231 (black lines). Fig 3. 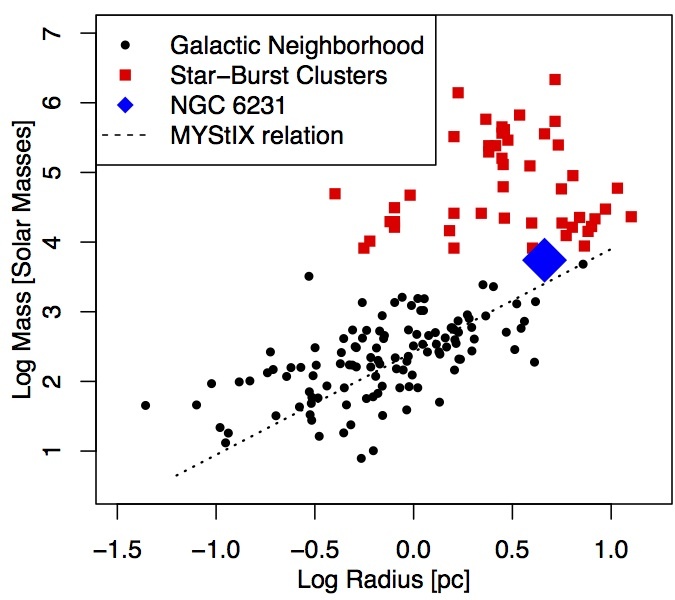 Size versus mass for NGC 6231 (blue point), clusters and subclusters from MYStIX (black points), and rare, extreme starburst clusters (red points). 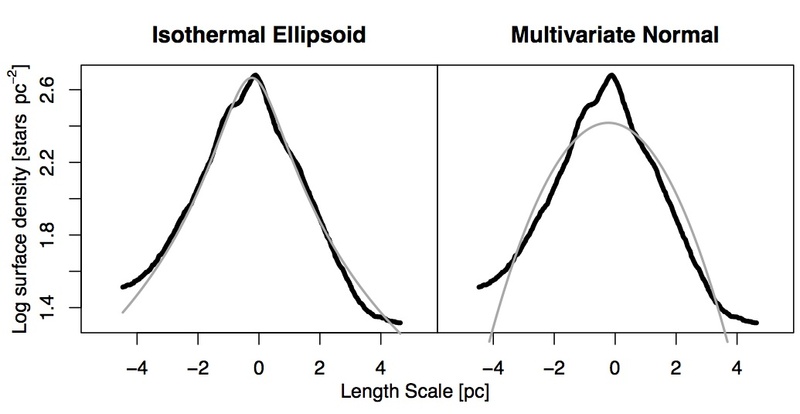 Adaptively smoothed maps of young stars in the different regions. MYStIX is a study of 20 of the most massive star-forming regions within 3.6 kpc of the solar system, which has yielded a catalog of >30,000 young stars -- including some of the largest and cleanest samples of cluster members for many of these regions. Catalog papers and science results are listed at the MYStIX public website (http://www.astro.psu.edu/mystix). The W40 (= Westerhout 40) star-forming region (also known in the literature as the Aquila star-forming region, part of the Serpens molecular cloud) is one of the nearest massive star-forming regions in the Galaxy. 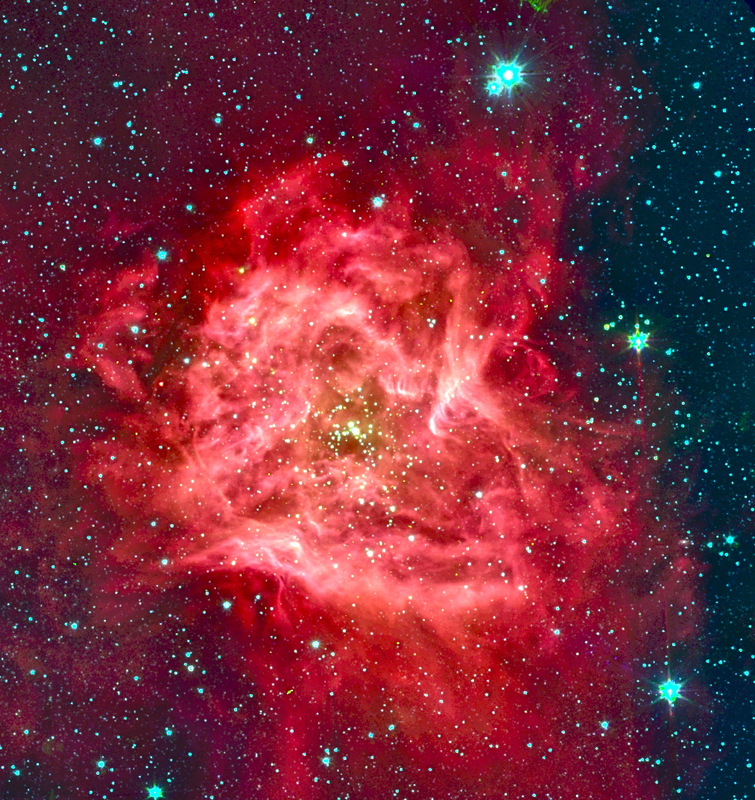 Observations with the Chandra X-ray Observatory revealed a cluster of about 600 young stars. Our inital study revealed a cluster that shows signs of being dynamically relaxed, including mass segregation, even though the it is likely to be less than 1 Myr old and to have ongoing star formation. With a new 80 ks Chandra observation we hope to double the number of stars detected and generate an improved model for star-formation in this region. In the image (left) the Chandra sources in blue reveal the young stellar objects within the figure-eight shaped nebula seen by MSX. Spitzer image of IC 5146. The SFiNCs project is a follow-up to MYStIX concentrating on star-forming regions that are lower mass and nearer. 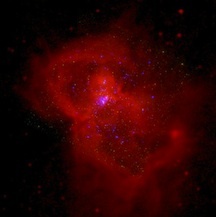 I was PI of the Chandra proposal to obtain X-ray observations of the nebula IC 5146 (pictured) for the SFiNCs project. SFiNCs provides the best catalogs to date for these regions, available online from this url. Code for finding what constellation your object is in. Original code by Nancy Roman (1987), updated for J2000 coordinates http://djm.cc/constellation.html. Annotation in R with expression. Link to Gaia DR2 form on VizieR.